The first series of pictures had caused varying reactions from people – inquisitiveness, disbelief and repulsion. People were fascinated by them, just as I had been by that first cellphone photograph. 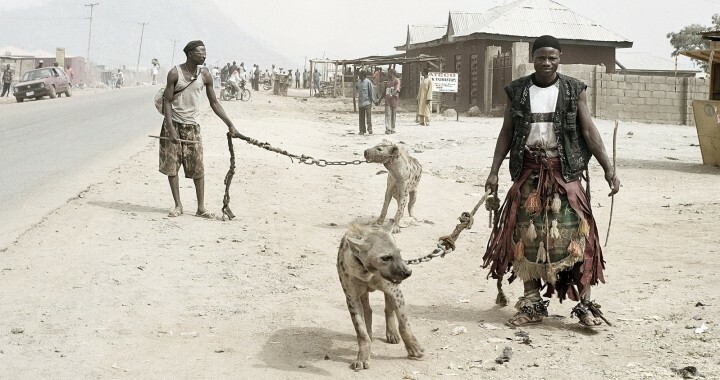 These photographs came about after a friend emailed me an image taken on a cellphone through a car window in Lagos, Nigeria, which depicted a group of men walking down the street with a hyena in chains. A few days later I saw the image reproduced in a South African newspaper with the caption ‘The Streets of Lagos’. Nigerian newspapers reported that these men were bank robbers, bodyguards, drug dealers, debt collectors. Myths surrounded them. The image captivated me. A few weeks later I was on a plane to Lagos. Abiola met me at the airport and together we took a bus to Benin City where the ‘hyena men’ had agreed to meet us. However, when we got there they had already departed for Abuja. 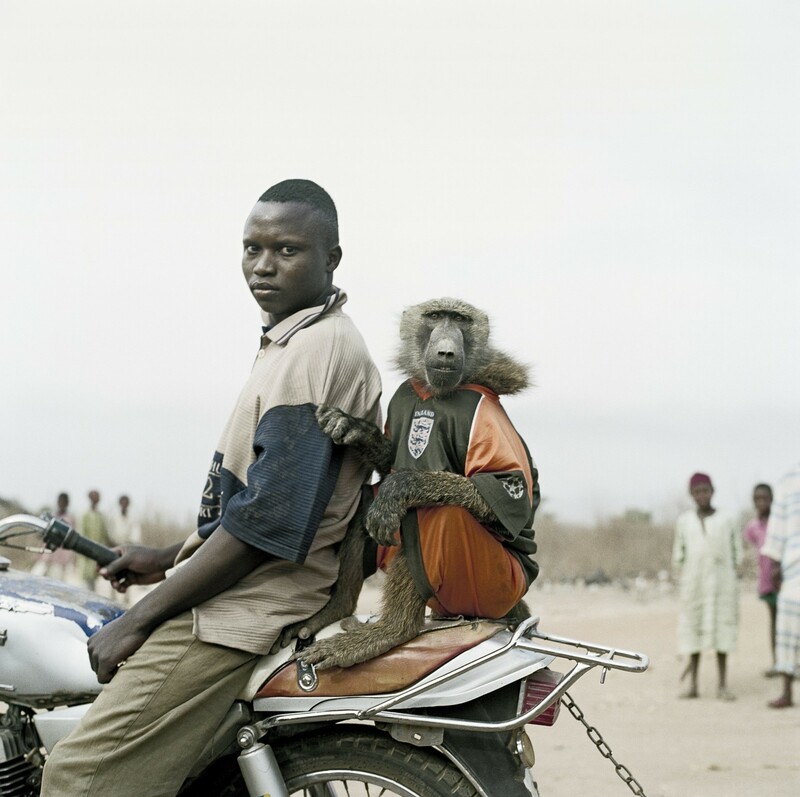 In Abuja we found them living on the periphery of the city in a shantytown – a group of men, a little girl, three hyenas, four monkeys and a few rock pythons. 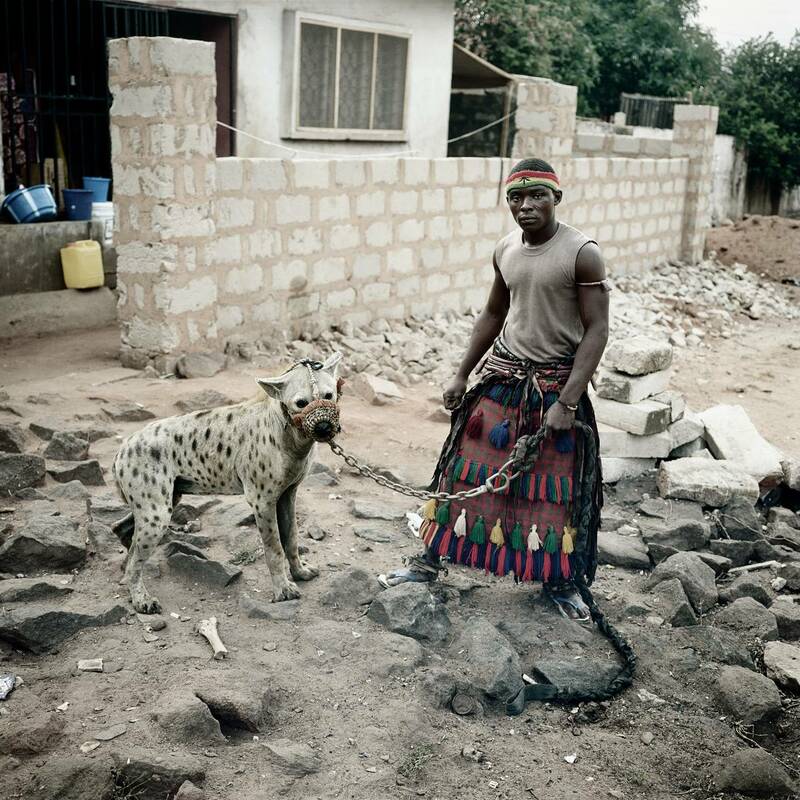 In Abuja we found them living on the periphery of the city in a shantytown – a group of men, a little girl, three hyenas, four monkeys and a few rock pythons. It turned out that they were a group of itinerant minstrels, performers who used the animals to entertain crowds and sell traditional medicines. The animal handlers were all related to each other and were practicing a tradition passed down from generation to generation. I spent eight days travelling with them. The spectacle caused by this group walking down busy market streets was overwhelming. I tried photographing this but failed, perhaps because I wasn’t interested in their performances. 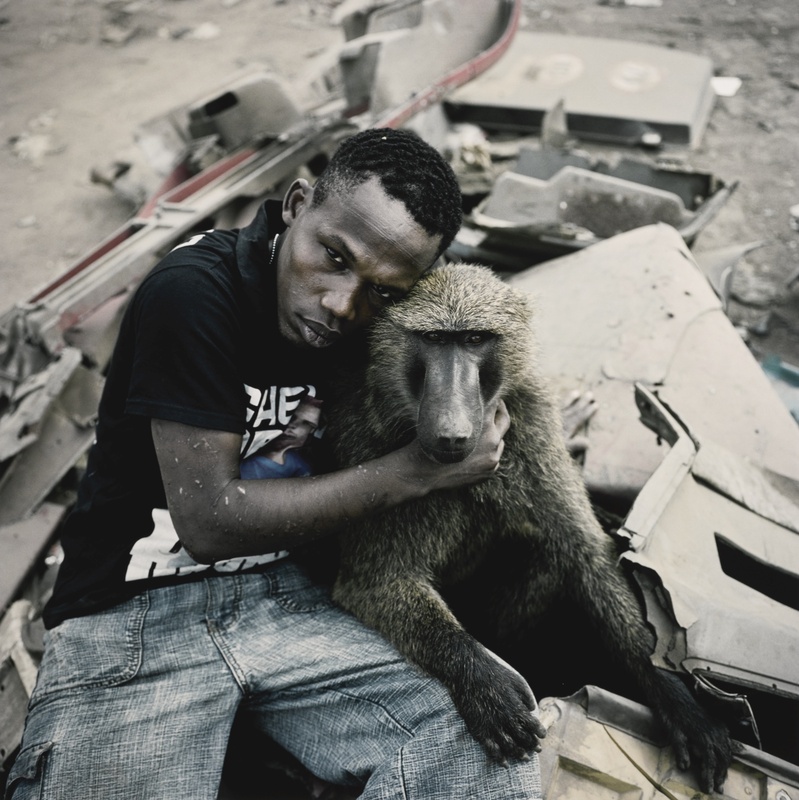 I realised that what I found fascinating was the hybridisation of the urban and the wild, and the paradoxical relationship that the handlers have with their animals – sometimes doting and affectionate, sometimes brutal and cruel. I started looking for situations where these contrasting elements became apparent. I decided to concentrate on portraits. I would go for a walk with one of the performers, often just in the city streets, and, if opportunity presented itself, take a photograph. We travelled around from city to city, often chartering public mini-buses. I agreed to travel with the animal wranglers to Kanu in the northern part of the country. One of them set out to negotiate a fare with a taxi driver; everyone else, including myself and the hyenas, monkeys and rock pythons, hid in the bushes. When their companion signalled that he had agreed on a fare, the motley troupe of humans and animals leapt out from behind the bushes and jumped into the vehicle. The taxi driver was completely horrified. I sat upfront with a monkey and the driver. He drove like an absolute maniac. At one stage the monkey was terrified by his driving. It grabbed hold of my leg and stared into my eyes. I could see its fear. Two years later I decided to go back to Nigeria. The project felt unresolved and I was ready to engage with the group again. I look back at the notebooks I had kept while with them. The words ‘dominance’, ‘codependence’ and ‘submission’ kept appearing. 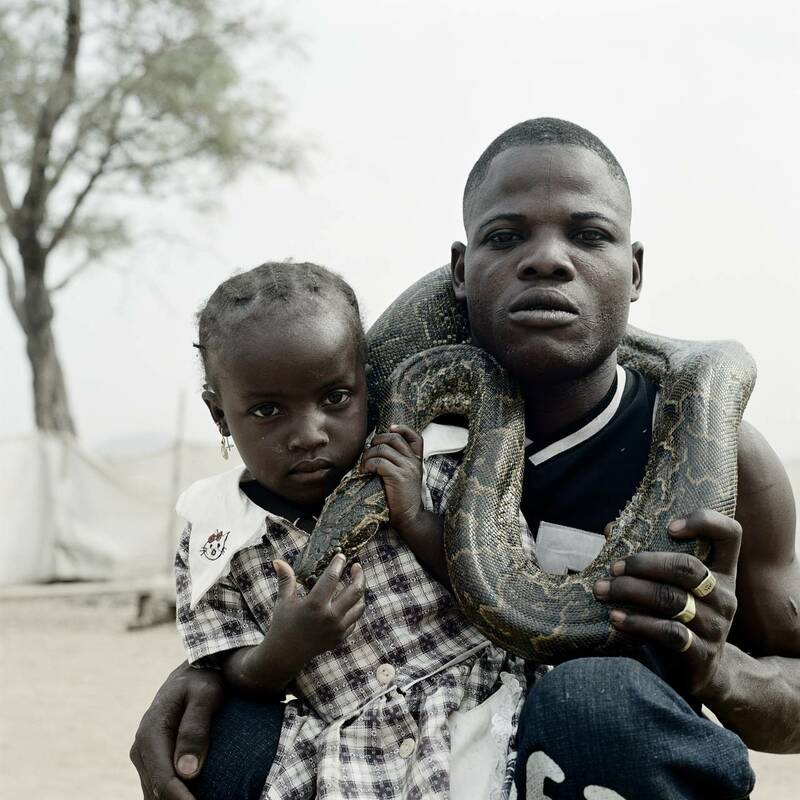 These pictures depict much more than an exotic group of travelling performers in West Africa. The motifs that linger are the fraught relationships we have with ourselves, with animals and with nature. YOU MIGHT ALSO LIKE: Shelby Lee Adams: "Portraits"
Europeans invariably only ask about the welfare of the animals but this question misses the point. Instead, perhaps, we could ask why these performers need to catch wild animals to make a living. The second trip was very different. By this stage there was a stronger personal relationship between myself and the group. We had remained in contact and they were keen to be photographed again. The images from this journey are less formal and more intimate. The first series of pictures had caused varying reactions from people – inquisitiveness, disbelief and repulsion. People were fascinated by them, just as I had been by that first cellphone photograph. A director of a large security company in the USA contacted me, asking how to get in touch with the ‘hyena group’. He saw marketing potential: surely these men must use some type of herb to protect themselves against hyenas, baboons, dogs and snakes? He thought that security guards, soldiers and his own pocket could benefit from this medicine. Many animal-rights groups also contacted me, wanting to intervene (however, the keepers have permits from the Nigerian government). 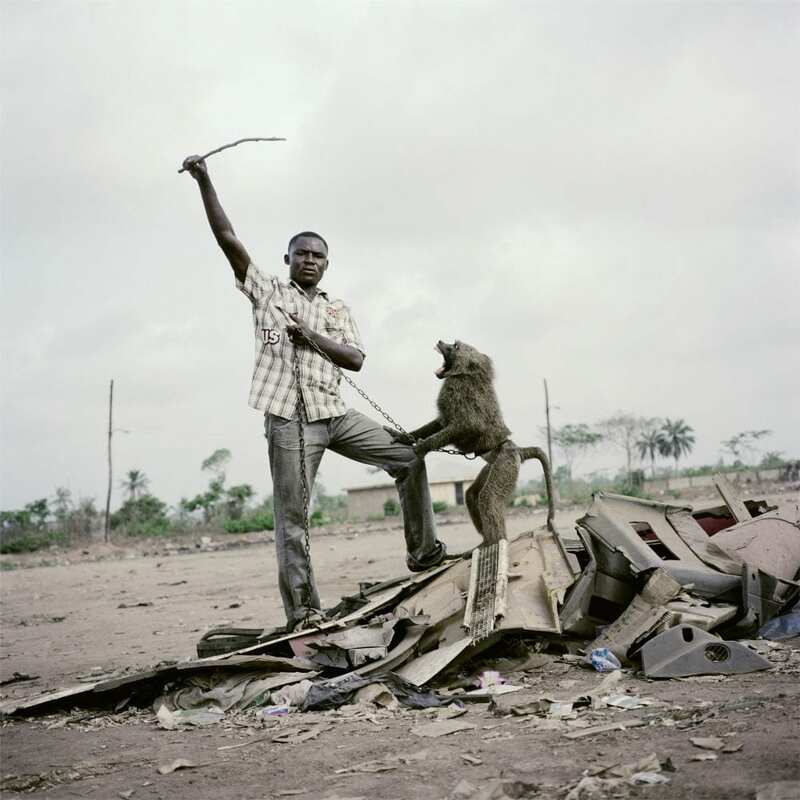 When I asked Nigerians, “How do you feel about the way they treat animals?”, the question confused people. Their responses always involved issues of economic survival. Seldom did anyone express strong concern for the well-being of the creatures. Europeans invariably only ask about the welfare of the animals but this question misses the point. Instead, perhaps, we could ask why these performers need to catch wild animals to make a living. Or why they are economically marginalised. Or why Nigeria, the world’s sixth largest exporter of oil, is in such a state of disarray. 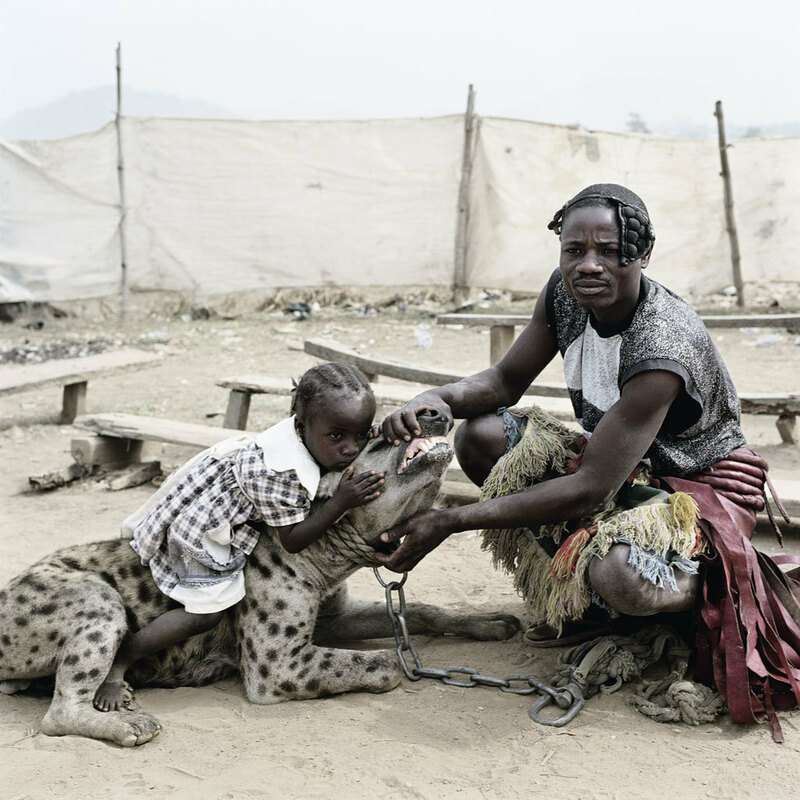 Posted in Essays, Highlights and tagged Africa, African Artist, Animal, Hyena Men, Lagos, Nigeria, Pieter Hugo, Portrait, Prestel, Top Picks, Yossi Milo Gallery.